Night snakes are uncommon to locally common in suitable habitat. They occur in the northern Sacramento Valley and in the foothills surrounding the entire Central Valley. 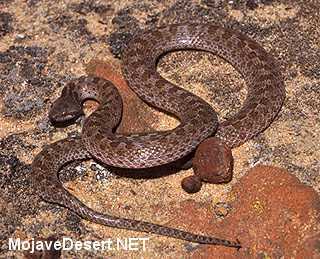 Widespread in southern California including Santa Cruz Island, night snakes are absent from the southern Sacramento and San Joaquin valleys, high elevations in the Sierra Nevada, the outer Coast Ranges north of San Luis Obispo Co., and coastal northern California. 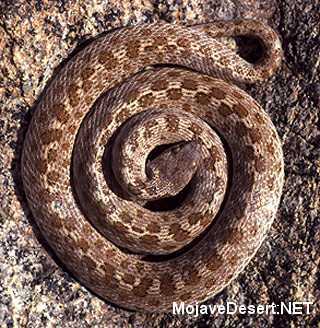 Although known only from an isolated locality in eastern Siskiyou Co., night snakes probably range throughout much of arid northeastern California. Found in a variety of valley-foothill habitats, chaparral, and desert shrub habitats. Elevation sea level to 1920 m (7000 ft). Feeding: The saliva of this snake is mildly venomous, which may help them secure small prey, especially lizards and occasional amphibians (Stebbins 1954). Cover: When not active this snake seeks cover in crevices in rocky outcrops, under surface objects, and in mammal burrows. The subterranean tendencies of this snake are evidenced by its being found occasionally by roadbuilding crews. Reproduction: The eggs of this species are laid in crevices in rocky accumulations. Abandoned mammal burrows may also occasionally be utilized as nest sites. Water: No information on water requirements. This is a snake of arid regions and is often found far from standing water, which is not considered to be an important habitat element. Pattern: Night snakes are most commonly associated with rocky areas or rock outcrops in a variety of habitats. Activity Patterns: Nocturnal and crepuscular, night snakes are almost never encountered abroad during the day. Periods of inactivity during cold weather occur at all localities. Seasonal Movements/Migration: Predictable seasonal movements have not been reported for this species. Home Range: The nature of the home range of night snakes is unknown. Territory: No evidence for the territorial defense of resources has been reported. Reproduction: Eggs are laid in June and July. Females deposit 3 to 9 (usually 4) eggs, which hatch in about two months. Niche: Night snakes are probably taken as prey by owls, nocturnal mammals, and other snakes. The nature of their competitive relationships with other species is not well understood. Clark, D. R., Jr., and C. S. Lieb. 1973. Notes on reproduction in the night snake (Hypsiglena torquata). Southwest. Nat. 18:248-252. Stebbins, R. C. 1954. Amphibians and reptiles of western North America. McGraw-Hill, New York. 536pp. California Department of Fish and Game. California Interagency Wildlife Task Group. Distinguishing characters: A pale grey, beige or light brown species; brown paired blotches on dorsum; usually three large black blotches on the neck, sometimes merging; venter whitish or yellow; flat head; vertical pupils; brown bar behind eyes; white labial scales; scales smooth, often with irridescence. Similar species: Arizona elegans: Have round pupils. Pituophis melanoleucas: Has round pupils; keeled scales. Crotalus viridis: Has rattle on tail. Additional notes: May flatten head, coil tightly, and vibrate tail when disturbed appearing as a viper. A gentle species that is easily handled. Often found under rocks.